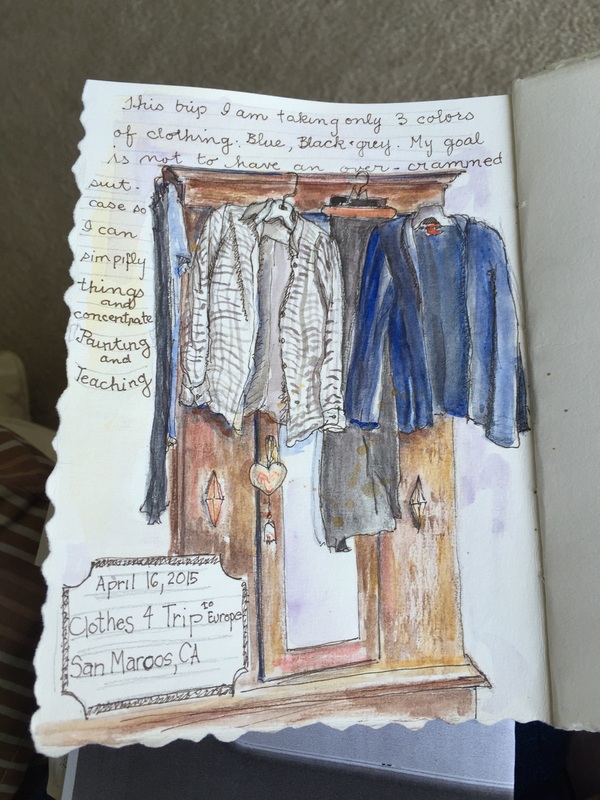 My travel journaling methods change from journey to journey as I discover new art supplies, art techniques and toss out methods that do not work well. Now I take a small amount of art supplies. I bring a journal that I make myself with my favorite kinds of paper, Arches 140 lb. cold press and Raffine mixed media paper. My homemade journal for SE England. Ollie seems to like it. I sewed in the pages in a very poor fashion. The size of the journal depends on how much time I have to devote to each page so I can complete the page in less then an hour. This trip, my goal is to chronicle in words and pictures my journey. I started with a page about packing, which is important to the success of my voyage. I have heard that journaling before a trip helps with "pre-trip nerves". Reminding yourself that that preparations need to be adequate but not perfect helps too.